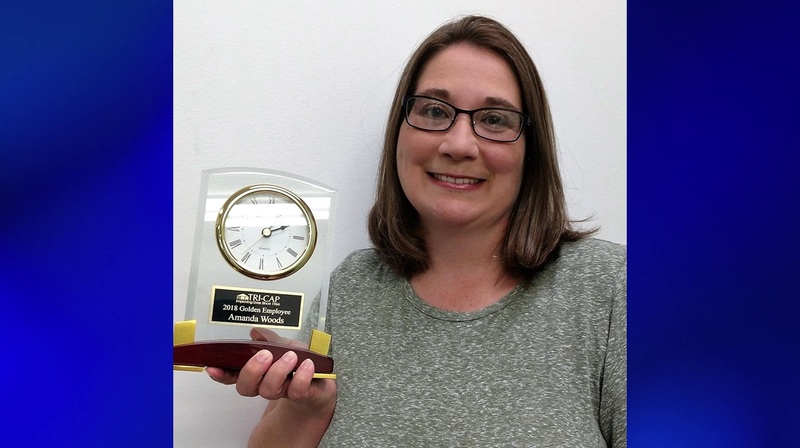 AREA WIDE -- TRI-CAP is pleased to announce that Amanda Woods, TRI-CAP Head Start Education and Disabilities Manager, has been selected as our recipient of this year’s Golden Employee Award. Amanda is the 8th recipient to receive this recognition award in memory of the late Bill Golden. Bill was a dedicated employee of TRI-CAP for more than 30 years before his death in March 2011. Bill cheerfully served the community no matter what he was called upon to do, be it providing job training partnership services to hundreds of young adults, directing the staff and dozens of volunteers for the Retired and Senior Volunteer Program, managing the Weatherization program, or filling a lesser support role within the agency while others managed the programs. Bill was willing to learn new things and complete any task no matter how large or small, regardless of who asked for his help. He certainly saw his share of changes over the decades, all the while exemplifying an admirable level of teamwork and a positive attitude. He worked cheerfully and always managed to lift the spirits of everyone around him, be it a co-worker, subordinate, funder, volunteer, or general member of the community. In honor of Bill’s positive impact on others, we recognize one employee each year that best matches his enthusiasm and spirit of teamwork while striving to serve others. TRI-CAP employees nominate co-workers for this award, with the final selection being made by our Director level staff team. Congratulations, Amanda! TRI-CAP’s health, housing, and education services change lives, empower families, and improve communities. To learn more, go to www.tri-cap.net or call 812-482-2233.